This edited article about Willem Barents originally appeared in Look and Learn issue number 943 published on 16 February 1980. “Ice haven” was the name that the crew of the little ship had chosen for the bay, and by now they were reflecting bitterly that their haven had turned into a hellish prison of ice. Earlier in that fateful year of 1596 they had set sail from Holland in search of the riches of China and now, even though it was only August, they were firmly trapped between floating masses of pack ice on the edge of the bleak Arctic land of Novaya Zemlya. 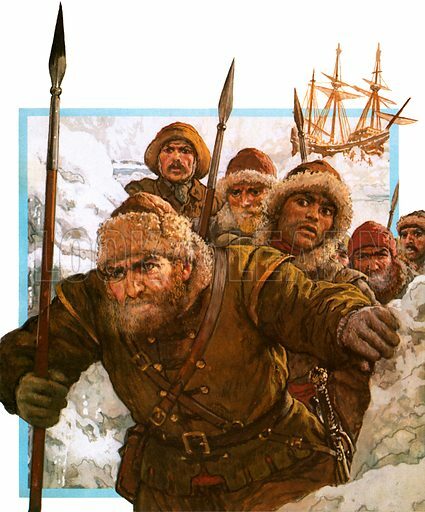 To them fell the honour of being the first Europeans to face the terrible Polar winter. Unlike many other explorers, the stout-hearted Dutchmen on this expedition, led by their captain, Willem Barents, were not seeking a north-west route to the spices of the Orient. Instead, they had set off in search of a north-east passage between the polar ice-cap and the frozen wastelands of what is now the northern Soviet Union. It was from the north-east that Barents’ downfall came, in the shape of a howling snowstorm in early September, which hurled their ship up onto the ice in the bay. “There drifted icebergs by us, as big as the salt mountains of Spain,” wrote the ship’s chronicler in awe. Numbed by the cold, the crew left to build a house on shore. Warm and snug in their plush mansions, the merchants of Amsterdam who had financed the expedition waited for news of their venture. The end of the 16th century was a time when huge profits could be gained from trade with the East, whose silks and spices were eagerly sought in Europe. The Dutch, smarting at the success already achieved by the English, were determined not to be left out. And they had complete confidence in the man they had chosen – Willem Barents. Born on the Dutch island of Terschelling around the middle of the 16th century, Barents was typical of the new breed of explorers. A bold and enterprising seaman with a fine reputation as a pilot, he was also well educated and an accurate observer. So the merchants had had no doubts about inviting him to discover for them the icy sea-way to China, the elusive north-east passage. Setting sail with the tide on 5th June, 1594, Barents left Texel on his first voyage to the Arctic. It was a minor epic in itself. He sailed over 1,700 miles of some of the world’s worst seas, and put his ship about no less than 81 times, but without finding the sought-after way through the ice. It is an area rich in resources, and was even richer then. As well as many different kinds of fish, there were polar bears, Arctic foxes, seals and whales; there was a profusion of duck, geese and gulls. Yet the coastlines were bare: some contained lichens and moss, even the occasional shrub, but it was inhospitable territory. Reaching the edge of the islands of Novaya Zemlya, Barents found his way barred, and reluctantly turned for home. The Amsterdam merchants were not pleased. Flora and fauna were all very well, they said, but silks and spices were what they wanted. Barents was dispatched again, but again he failed. The merchants, however, blinded by the dazzling prospects of rich profits, were not discouraged. They persuaded Barents to lead another expedition, and early in the summer of 1596 he set sail on his final voyage. This time Barents headed almost due north, and discovered the island of Spitzbergen (“sharp peaks”), which he wrongly thought was part of Greenland. Turning south to Bear Island, his little fleet sailed over to Novaya Zemlya, which he had discovered on his first voyage. Conditions were so bad that he sent one ship back. For a month Barents battled against ice and head winds, still searching for the passage . . . and then the ice closed in. At first things did not look too bad. They had ample stores, and were able to take wood from the ship to build what was, in the circumstances, a remarkably solid and cheery house. It was desperately cold, and building the house was something of a nightmare. But soon they had thatched the roof with sailcloth and seaweed; made a steam bath out of a wine cask; fixed a chimney in the centre of the room; hung up a Dutch clock that struck the hours; and made rows of beds along the walls of the house. But nothing had prepared them for the savagery of the polar winter. Soon their house was covered in snow, and ice lined the walls inside. They had to dig a tunnel to reach the outside, and, now that stores were running low, they had to hunt to survive. That any of them lived to return to Holland was due to the wild fauna which their merchant backers had so despised. They lived almost entirely on Arctic foxes, eating the flesh and using the skins for clothing. When, in early June, 1597, the crew were finally able to make their way back to the ship, they found it too damaged to be of any use. Weak and on a stretcher, Barents gave orders to abandon it and to take to the two open boats. Within two weeks the courageous explorer was dead, and the crew had to continue without him. Their trip back to civilisation was the most dangerous part of all. A month to the day after Barents’ death they were surrounded and their boats nearly capsized by a herd of walruses, but they managed to fight off the creatures and escape. The resolute Dutchmen finally reached Kola, in Lapland, on 2nd September. There they were fortunate enough to be picked up by a Dutch vessel. Almost three centuries later the house that Barents and his crew had built was discovered. It was miraculously well preserved: the cooking pans stood over the fireplace; books and instruments lay scattered on the floor; even the Dutch clock hung in its accustomed place – though its last hour, of course, had long since struck.